The 30-inch Sur-Moor Taper Buoy is the largest taper buoy produced by Taylor Made and is available now at Boatersland Discount Marine Supplies. 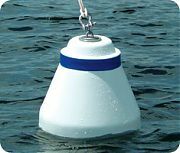 This buoy, part number TAY46730, is ideal for mooring larger boats as this product has a buoyancy of approximately 410 pounds. The buoyancy rating is the maximum floatation the buoy provides while fully submerged. Approximately 50 percent of this value will be the weight the buoy can support at the level of the blue stripe. The taper shape results in high visibility as the blue reflective striping is located near the top of the structure. The 30-inch taper buoys stands 30 inches high, has a buoy diameter of 30 inches and a tube diameter of three inches. This buoy, as do all of Taylor Made’s hard skin buoys, has a three-year flotation warranty. Hardware for this buoy is not included but is available for purchase at Boatersland Marine. This 30-inch taper buoy uses the Taylor Made three-inch T3C mooring collar (part number TAY33028).